There are cases where we need to create third party web portals to use for authoring instead of using AEMM authoring. Advantage of using such system is to isolate authoring from AEMM environment. To setup an independent suthoring, AEM Mobile supports API services. Below are the steps involved. 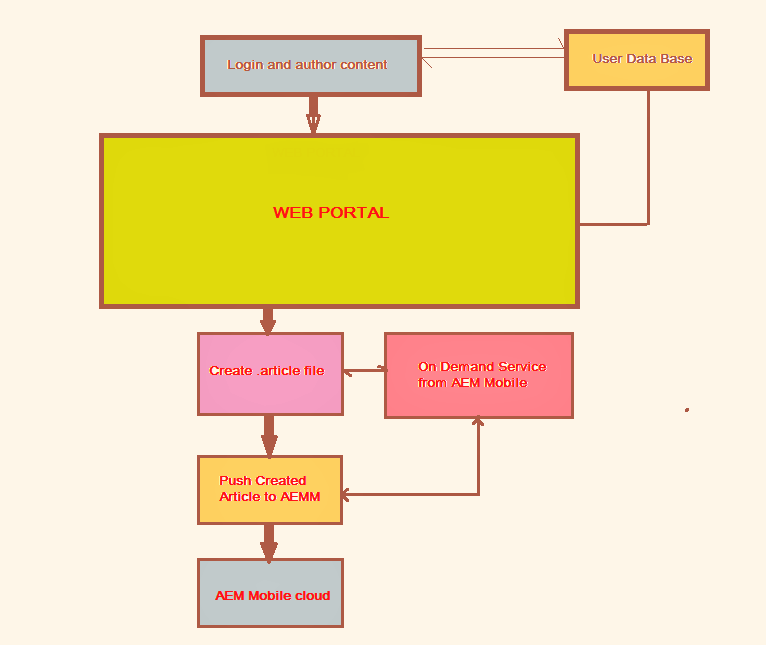 Webportal is a third party application, which can be created to author in AEM Mobile. Web portal interacts with AEM Mobile using the on demand API's provided by AEM Mobile. Web portal can be created in any language which will have its own database used for authentication and then for authoring AEMM content. AEMM master admin should create an AEMM user with content creation access permissions. This user can be configured in webportal then. Webportal helps to upload AEM Mobile page content once logged in, and on submission it creates '.article' files with its manifest file using On Demand API. This creates .html file through its service. On-demand api push this article to AEMM using created AEMM content creation web portal user id.